I used my plunge router w/ a 3/4” straight bit to start the holes then finished them with a spade bit. I’d suggest they don’t have to be perfect to work as holes for hold fasts or dogs, either one. I’m sure the holes in my bench top are not. +1 to what Smitty said. 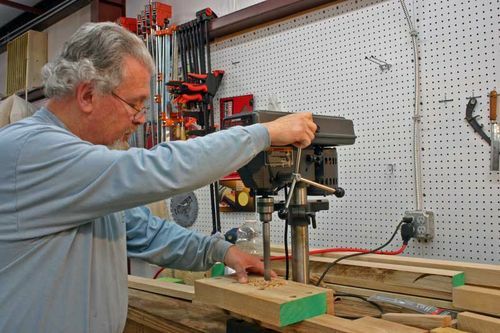 If you really want perfectly vertical, you could drill a perfectly vertical hole in some scrap using your drill press, then clamp that scrap to your bench with the hole in the scrap located where you intend to drill a hole in your bench. 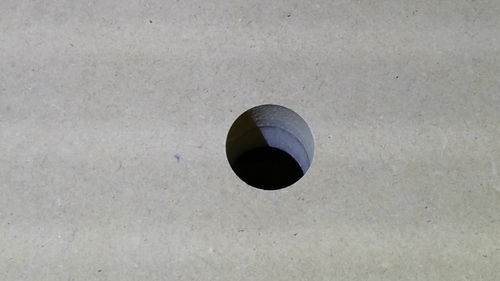 Use the “true vertical hole” in the scrap as a guide for drilling free-hand into your bench. ^ That’s a fine suggestion! 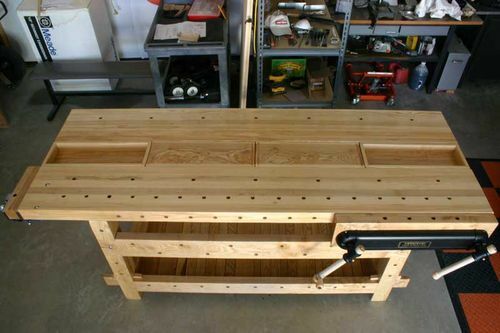 I drilled my first bench with a plunge router ( as deep as it would go)...finished them through with a spade…..they are perfect and nice….it took me forever. I drilled my second bench with a “General” company fixture for the front of a hand drill that looked like a plunge router…it was quicker but still a little labor intensive for me…I used a forstner bit. My neighbor asked for my help and We used the drill “fixture from General” to drill a hole maybe an inch deep and finished it off by hand with a second drill and operator and it was much quicker! We used a couple of Deming 3/4 drills ( Deming drills are 1/2 shank…you can buy them individually).....I found that my spade bit was a little light of 3/4…enough so the dogs fit rather tight. I believe that was almost as accurate if not just as accurate…As Smitty said…I’m not sure its that critical to be perfect. I also put a very light chamfer on with my colt pony palm router. If anything, it’s preferred to have a ~2 degree angle pointing towards the vice. 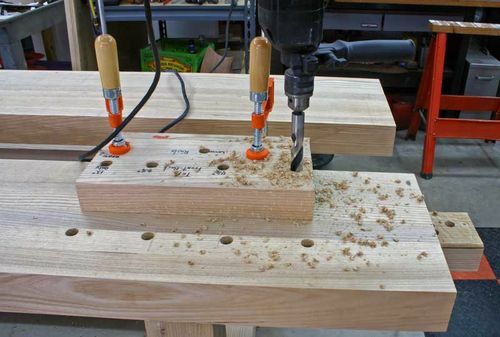 You can also use a DIY drilling jig. Fasten 2 boards together at a 90 deg angle and put it on it’s side. Use the corner as a guide to drill straight. I used a 3/4” anger type bit that was long. 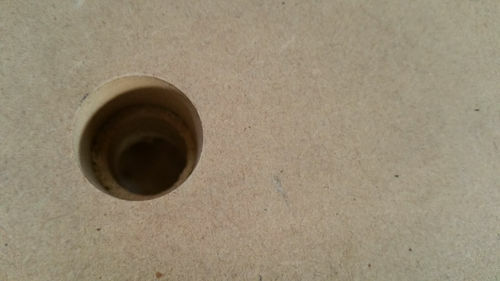 I drilled a hole in a 3” block of hardwood on my drill press and the used it as a guide. There is no earthly reason why dog holes need to be straight in the first place, so don’t worry about it. 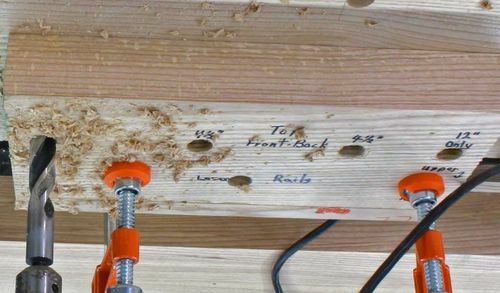 Bench dogs or holdfasts work just fine in 87 or 93 degree holes. There is no earthly reason why dog holes need to be straight in the first place, so don t worry about it. Bench dogs or holdfasts work just fine in 87 or 93 degree holes. I did my dog holes like this … between 11:47 AM and 12:33 PM every day for 3 months … all holes are 88.569° to 92.368° … works just fine! I’ve used a plunge router, but since I didn’t have a 3/4” bit that would drill holes, I used a 1/2” and then went back later with a fluted 3/4” to enlarge them. Took a while, doubt I’ll ever do that again. I bought the LV bushing for the last go around, and it really works well. Tried all the above methods with varying success and ended up using a hand brace, quickest and as accurate as needed for my Gramercy holdfasts. Put in a row of Veritas Prairie Dog for the tail vise and really like them. Like Andre said you can get awfully accurate with a hand brace and auger bit. An easy way to line up the brace is to hold a square next to it and check it from two directions, especially as you start. Then the bit will guide itself after a while. The other tricks mentioned here like guide blocks will work fine if you don’t have a brace and the right size bit. For my latest bench I decided I didn’t need nearly as many holes as some of the benches I have seen sold commercially or in photos on the web. 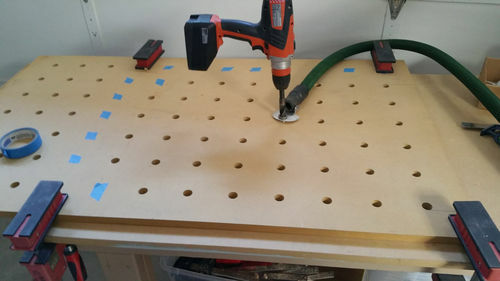 New plan: Drill only holes when I need them. 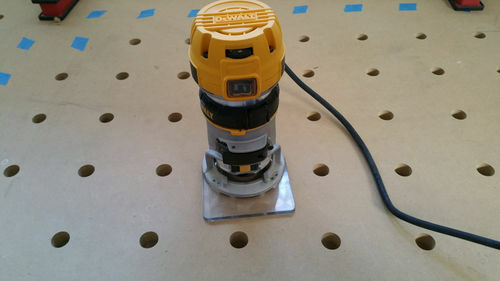 My method is to chuck a spade bit in my drill and just drill through my 3.5” bench-top as vertically as I can. I then go back and sand the rough edge of the hole. Are they perfectly vertical? Some are. Some aren’t. It makes no darn difference to the dogs or holdfasts. 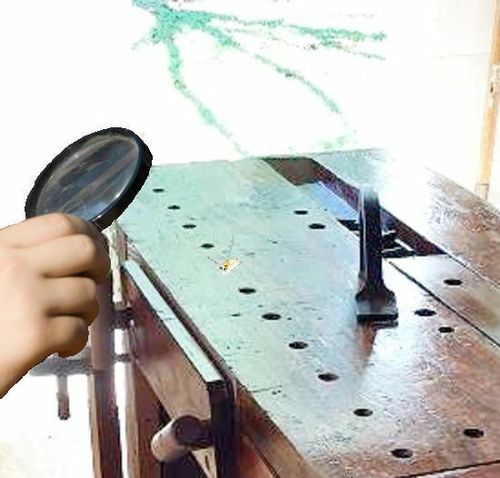 Heck, I’m not even putting the holes in a straight line on my bench. I just grab the bit and brace whenever I need a new one, sorta eyeball vertical, and drill away. Got a half-dozen holes all clustered on one end now.